Genuine Stainless Fire Poker 48" TM is a all stainless steel fire poker that is 48 inches long and made from 3/8 diameter 304 grade round bar. We take pride in making high quailty products in the U.S.A. Comes with a lifetime warranty. 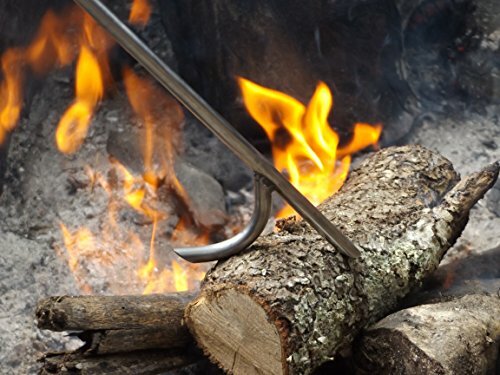 Genuine Stainless Fire Poker 48" TM is our most AFFORDABLE Stainless Steel fire poker. Invest in American Made In The U.S.A. Portion of proceeds goes to the Disabled American Veterans and National Law Enforcement Officers Memorial Fund. Extra Long 48 inches long and Made from 3/8 diameter 304 grade stainless steel and Tig welded hook . Simple sleek design no Silly Wooden handle to rot away. This will be the last fire poker you will ever have to buy! If you have any questions about this product by Genuine American Products LLC, contact us by completing and submitting the form below. If you are looking for a specif part number, please include it with your message.